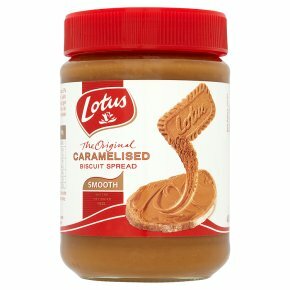 If you haven’t heard of Biscoff before, it is a caramelised biscuit spread from the brand Lotus. Sometimes it is described as ‘Speculoos’ which comes from the Dutch biscuits that the spread originates from. It is also known as Cookie Butter and a few other brands make it too, but the Lotus version pictured below is the only one available in the UK at the moment. You can get it at most supermarkets in both crunchy and smooth, and it can be found on the same aisle as the jam and Nutella. I started by melting 225g butter on a low heat. After transferring the melted butter to a mixing bowl, I added 400g caster sugar and mixed until fully combined. I beat in 3 eggs, one at time and mixing in between, and 2 tsp vanilla extract. I made a last minute to decision to throw in a bag of chocolate chips and did so along with 85g cocoa powder, 1/2 tsp baking powder and a pinch of salt. Finally I folded in 125g plain flour and poured the mixture into a lined square baking tin. I baked on 180C/350F/Gas Mark 4 for 30 minutes. I left them to cool in the tin on a cooling rack. Making the Biscoff topping involved a bit of guesswork. There are several different ways you can do it. Some people use milk, and some use double cream. I decided to use cream cheese, or rather the contents of my fridge decided for me! I mixed 100g Biscoff, 30g butter and 5 tsp cream cheese. Also at the end I added another 1 tsp each of butter and Biscoff. I think milk or cream would create a smoother glossier finish. I spread the mixture over the brownies and cut them up to serve. The brownies were super squidgy and moist – I recommend this recipe even if you don’t top it with Biscoff! I really liked the mixture of the caramelised biscuit flavour with the gooey chocolate. It definitely enhances the brownies and isn’t overpowering. I devoured a piece in a very short time! Have you tried Biscoff yet? What do you think? Great minds! I look forward to seeing what you've made! Thank you Susie, yes definitely worth giving it a whirl, if only to satisfy curiosity. Thanks! I hadn't even heard of the biscuits so you probably have a good idea of what this tastes like if you like them. Looking forward to seeing what you make with it!